It has been a while since I updated this website. A lot has changed in three years. I am no longer interested in Windows application development, nor contract web development. As a result, I think the time has come for this website - which has stood for 8 years in an almost unchanging state - to be replaced. I am working in embedded hardware and software now, exclusively with Linux. The new website should reflect that. I will remove the ability to download the applications currently on the site, as I feel they should not be used due to their extremely outdated codebase. I have no idea when the new site will be done, however it will be before the end of the year for sure. I want to thank everyone who has used my free applications over the years, and by applications, I pretty much mean Timeout. I never thought that the simple idea I had when I was learning to program (Visual Basic of all things!) would actually have users at all, let alone the hundreds of thousands of you. I never really used it myself, it was all just for the practice and for the community. I stopped because it became too much of a time commitment and I was no longer using Microsoft products, so development was impossible. I am an open source activist, however I'm not releasing the code to any of my applications out of the sheer fact that they are not fit for development in this day and age. The code would need to be completely rewritten, which defeats the point. I am working on some really neat open source and open hardware embedded projects, which I will make public once they are ready. 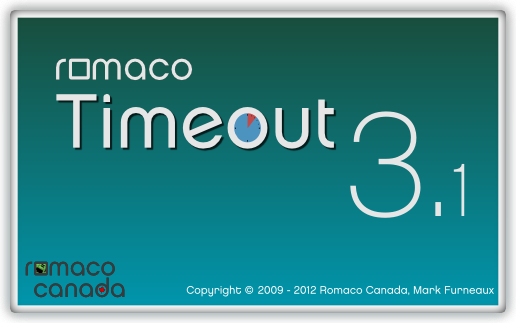 Romaco Canada has permanently discontinued Timeout. Please see News for more information. Romaco Timeout is a free computer tool that can restrict the amount of time that a child (or anyone) uses their computer for and much more.